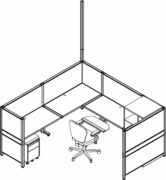 ECO Station is CORCAN’s innovative update on the traditional post-and-beam workstation—fully reconfigured for the modern, electronic office. 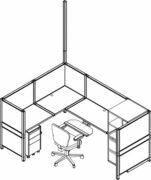 Completely modular with advanced wiremanagement capabilities, ECO Station transcends the standard workstation with reception and mini-conference configurations in multiple layout possibilities. With a range of available panels, work surfaces, and accessories to meet every need, ECO Station lets you combine workstation and other space requirements at minimal extra cost. Interchangeable and handsomely designed work surfaces create the signature look for all ECO Station layouts. The ECO Station “P” work surface can function as both work area and a meeting place. Functional, lightweight flat panels are an integral part of any ECO Station layout. Low profile pedestal cabinets fit beneath work surfaces for easy integration with any ECO Station layout. Pedestals combine efficient storage with at-your-fingertips access to documents, office supplies, and personal items. Standard beam location is located just beneath the work surfaces. Additional beam can be added along the bottom. Upper and lower beam applications enable segregation of data and communications wiring outlets from power conduits and outlets. As with all CORCAN office furniture lines, ECO Station can be custom-ordered to fit seamlessly into any environment. 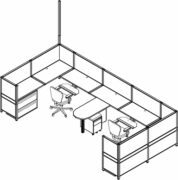 CORCAN design and manufacturing professionals will be happy to help you create the ECO Station solution that takes your workplace to new levels of form and function. 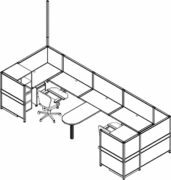 Contact us today about enhancing your office with CORCAN ECO Station.